Think a vegetarian diet can’t give you the right nutrition for your training? Well think again – there are plenty of examples of world-class athletes who have shunned meat. David Haye, Lizzie Armistead, and Serena and Venus Williams, Brendan Brazier and Martina Navratilova to name a few. Whether you’re a veggie sceptic, a committed vegetarian, a part-time veggie (‘flexitarian’) or among the one in three people who have cut meat over the past year (or the 50,000 who have signed up for the Veganuary campaign), it’s worth keeping a few things in mind to make sure your diet is as healthy as possible. Here are my nutrition tips and tricks for athletes on a vegetarian diet. Make sure you’re getting a variety of vegetarian protein in your diet every day by eating a range of dairy foods, eggs, nuts, seeds, beans, lentils, soya products (tofu, tempeh), whole grains and quinoa. For optimal muscle recovery, vegetarian athlets should aim for 0.3g/ kg body weight (roughly 20 – 25g) post-exercise and per meal. This is equivalent to 500ml milk or 25g whey, soya, pea or hemp protein (mixed with water), or 4 tablespoons (200g) cooked pulses combined with 5 tablespoons (250g) cooked whole grains (pasta, rice or quinoa). Iron from plants is harder for your body to absorb than iron found in meat. The easiest way round this is by always eating a vitamin C-rich food (i.e fruit, vegetables) at the same time as iron-rich foods. The citric acid found naturally in fruit and vegetables also promotes iron absorption. Foods high in iron include whole grains, quinoa, nuts, seeds, beans, lentils, green leafy green vegetables, dried fruit and egg yolk. Vitamin B12 can only be obtained from animal sources. So vegans will need to supplement B12 or include a B12-fortified non-dairy milk, yeast extract or breakfast cereal. For vegetarians, adequate amounts can be obtained from eggs and dairy products. Lack of B12 can result in anaemia and impact adversely on endurance performance. Omega-3s are vital for heart health and brain function. They can also help reduce inflammation and promote recovery after intense exercise. The main source of the essential fatty acids EPA and DHA is oily fish, but if you’re vegetarian you’ll need to get them elsewhere. You can get alpha linoleic acid (ALA) from flaxseeds, hemp, chia seeds, pumpkin seeds and walnuts. Some of this is converted to EPA and DHA in the body (albeit inefficiently). Try to include at least one tablespoon of these in your diet each day, or consider taking a vegetarian omega-3 supplement made from microalgae oil. Fish get their Omega-3 from eating algae. Can a vegetarian diet allow you to reach your athletic potential? The resounding answer is yes! My last post detailed results of a recent study that found vegetarian diets can indeed support strength and fitness development and may even be advantageous for some athletes. 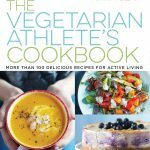 A review by Australian researchers found that well-planned and varied vegetarian diets neither hinder nor improve athletic performance. In 2004, Canadian researchers showed that vegetarian diets can provide more than enough protein to support athletic training and performance.